Yet another version of Pathetique and another umptienth version of America. The bonus tracks listed above are mostly taken from the debut album and believe me! Check out that one. Even completely out of their context , those tracks dwarf out whatever material present on the original vinyl. This gives you a hint? All joking aside , there is not much of an interest even for die-hard Emerson fans, I believe this got released to fulfill the rest of a contract so emerson could start his supergroup. Sure sounds like it! Better avoid unless you have too much money!!! Nice artwork sleeve, though! Looks like Hypgnosis work. As the title suggests this was a postscript to the band's career and was only released to cash in on Emerson's success in ELP.It's easy to understand why this material was not released earlier.Somewhat pointless exercise from an artistic point of view.Best go to 'Five Bridges Suite' or 'The Nice' to find out what this band was really about. Elegy is a posthumous, mainly live release that contains some of Keith Emerson's most fiery moments. Every track except My Back Pages had been released before, but Hang On To A Dream and America certainly were reworked beyond recognition. Hang On To A Dream is brilliant and even Lee Jackson's singing isn't bad. It contains some dazzling piano work by Keith, before the band takes off on a mammoth jazzy flight that eventually becomes an avant-garde experiment before boogie-woogie Keith comes into his own with another acceptable vocal part at the end tying the jam together. America is all fire and brimstone, with another absolutely towering performance from Mr. Emerson who plays like there's no tomorrow and goes out in a blaze of pyrotechnics and sonic effects. However, I never liked The Nice's take on Tchaikovsky's Pathetique Symphony and while this version is marginally less dull than the Five Bridges Suite attempt, I usually give it a miss. But nothing can quite compare to My Back Pages. The Nice's treatment of this Dylan classic is notable most of all because Lee Jackson turns in what must be rank among the all time worst vocal performances in recorded history. One of Keith Emerson's most lyrical turns on piano is all but swept away by the only man who's mangled Dylan's lyrics more than Dylan himself. There's a great swinging jazz organ solo in the middle of it all, but that's soon forgotten when Jackson returns. Seriously this has to be heard to be believed. When the man starts scatting ... you swear he's taking the piss ... but apparently he was dead serious! If ever a song needed to be left in the vaults, this was it. 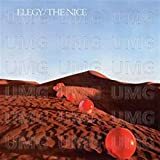 The Nice's posthumous collection (not really an album), "Elegy", is in my opinion their most mature and significant work. After pioneering band folded due to their label's shrinking finances and Keith Emerson's burgeoning ego, their manager, (Tony Stratton-Smith of later Genesis fame) managed to salvage enough tapes to scrap together "The Five Bridges Suite" album and this one. And despite Mr. Emerson's chagrin, boy am I glad that he did. On "Elegy", we see a band with severely underrated Jazz sensibilities and chops that are too often overshadowed by their successor, the brobdingnagian Emerson, Lake and Palmer. The album kicks off with a live rendition of what is in my opinion the Nice's signature tune, "Hang on to a Dream". Borrowed from folk-ster Tim Hardin, this track features some faux-classical flourishes from Emerson on Piano mixed with choir tapes and some of Lee Jackson's (Bass) most tolerable vocals. After the grandiloquent phrasing of the opening (which is quite beautiful, an adjective not often associated with Mr. Emerson), the song really begins to pick up. While the actual song part in the beginning is pretty and pleasant, the next eight-or-so minutes are what really dazzle the listener. We are presented with some of Mr. Emerson's best keyboard work on record. Emerson fluidly skirts the line between modern Jazz and prog-rock showboating, all while remaining tasteful. Its best quality is that it sounds nothing like Mr. Emerson's later work - it is straight piano, no ghastly Moog. While I cannot sing the praises of Emerson's half-improvised/half-composed dexterity on this track, the rhythm section of Lee Jackson and Brian Davidson (drums) are hardly slouches. Jackson lays down a bass line which is as close as one can come to sounding like an upright double bass on an electric. Davidson is no Carl Palmer, but who else is? (Bill Bruford excluded). This track alone is worth the price of admission. Next we have "My Back Pages" a Bob Dylan cover. The nice were often more interesting as coverers than as composers in their own right. Here we have one of the most grating vocal performances known to civilized man, in which Mr. Jackson sounds constipated and half-drunk. Once one gets past this, however, the remainder of the song is excellent, with Keith Emerson delivering some fantastic piano and later organ solos, this time in more of a rock vein. And, for another cover, we get the obligatory classical-rock piece, this time a reworking of Tchaikovsky's ""Pathétique" Symphony No. 6, 3rd Movement". This version is actually quite lively, far more so than the version released a year earlier on "Five Bridges". This piece sounds much less like the Nice however, and much more like proto-ELP which is unfortunate. The musicianship throughout it top-notch, and despite its complexity, it simply doesn't deliver the excitement of the much simple Dave Brubeck reworking "Rondo" and "Rondo '69" that they did on earlier albums. The song is perhaps a little overlong, but certainly isn't bad, just pedestrian (for these musicians). We are treated solely to Mr. Emerson's organ, and the lack of Piano is noticeable. (In light of the ELP onslaught not too far in the distance, one wishes Emerson had more Piano recordings). The record closes with the umpteenth rendition of The Nice's biggest (only?) hit and signature number, "America", notable for both its music and politics. Here we are given one of the more distorted and less melodic renditions of Leonhard Bernstein's "West Side Story" number. It is certainly interesting, and will get you in a certain head-banging groove, but it certainly begins to drag at around the six minute mark. There simply isn't anything there that the Nice hadn't said better and shorter earlier. It is a feast for anyone who loves heavily distorted and discordant Organ feedback, but is only of passing interest to the rest of us. In conclusion, "Hang on to a Dream" and "My Back Pages" certainly make this album a worthy acquisition for anyone interested in Keith Emerson, 60's prog-roots, or Jazz Piano. Side One is incredible, but Side Two drags down the proceedings. 7/10 stars. It was (the) nice while it lasted, but Emerson had already fired the help and gone to a higher ELP when Elegy was released. This album combines of pair of unreleased live and studio tracks (which is which isn't worth the wondering). If there was any doubt that Keith Emerson was The Nice's main attraction (and I don't think there was), Elegy removes it. He sets the tone at the beginning of each piece, adds wry instrumental commentary, delirious solos, and drives the arrangements from dawn to dusk. Any discussion of The Nice inevitably leads to ELP, as the one was a blueprint for the other. You'll hear the future echo of ELP's playful iconoclasm and classically inspired rock in most of these songs; in any song from The Nice, really. Lee Jackson didn't have the vocal presence of Greg Lake, wasn't what you'd call a brilliant bass guitarist, but Brian Davison was a good drummer. Both players get buried under the avalanche of Emerson's towering talent, and it's unlikely that Davison and Jackson had even half a say in the final arrangements; at least they don't trip in their pursuit of Emerson (just check out the trio on their Tchaikovsky piece). While the four songs recorded here are hardly fluff, Elegy isn't an album proper. Only their playful interpretation of Bob Dylan's "My Back Pages" (which foreshadows "Jeremy Bender") is entirely original to this album, and it's mostly a showcase for Emerson. Live versions of "Hang On To A Dream" (again with Emerson uber alles) and an explosive "America" (which is worlds apart from the version Yes would later record) are at opposite ends of the energy spectrum. A return to Tchaikovsky's Pathetique Symphony is engaging, but some may still have mementos in their mind from Five Bridges. As posthumous compilations go, I've heard worse (from Traffic to Cream), noting that it's historically not a rich field of research. 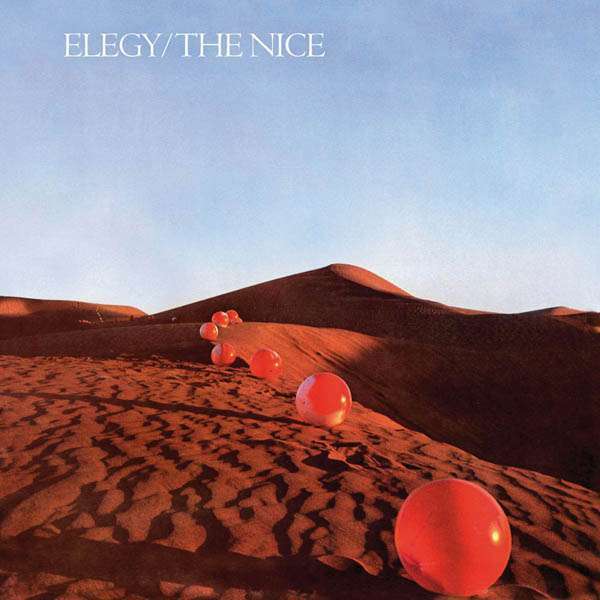 My copy of Elegy is the second LP of a double album entitled "Keith Emerson and the Nice". 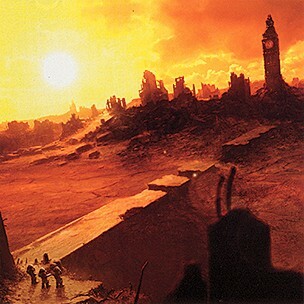 The first LP is "Five bridges". The words "Keith Emerson" are much larger than "The Nice" reflecting the marketing viewpoint that Nice albums sell almost entirely due to Emerson's involvement. While this may be partly true, it rather underplays the contributions by the other members of the band. Emerson was undoubtedly even then the showman, and his musical influence was undeniable, but The Nice were very much a band where all the members pulled their weight. Elegy was the band's final official release, although there have been any number of repackages, unreleased tracks etc., since. Even then, this is simply a posthumous compilation of four tracks, two of which were recorded live and two in the studio. The two live tracks were recorded in New York towards the end of the band's time together. Tim Hardin's "Hang on to a dream" is considerably extended from the studio version which appeared on their self titled release, the extension being primarily down to a "Piano improvisations" like jazz break and an even less structured, over indulgent section. For me, this bloated interlude destroys what was originally a fine cover version. The 10½ minute romp through "America" (which closes the album) ensures that the second side of the album remains devoid of vocals. This is undoubtedly the best of the four tracks here, and one which will please all fans of prog in excess. The additional time (when compared to the studio version) is used to fine effect through further pomposity and indulgence. The only new track as such here is a cover of Bob Dylan's "My back pages". This 9 minute studio recording maintains the focus on piano, with Lee Jackson's vocals being frankly rather poor. Emerson eventually switches to organ for a decent solo (pretty much the one on "Blues variation" on ELP's "Pictures"), supported by some rather clumsy bass-work. New as this song may be in Nice terms, I cannot in all honesty recommend seeking out "Elegy" simply in order to acquire it. In a reversal of the inclusion of two live versions of studio tracks, the version of the Third Movement of Tchaikovsky's "Pathetique" is a studio recording of a piece first heard live on "Five bridges". This rendition does not really add anything to (or indeed take anything away from) that version, indeed the impression is gained that this was recorded live in the studio. In all, a rather poor epitaph for a band which showed great promise. In retrospect, it is clear that Emerson needed to work with musicians who were capable of challenging him and driving him on to his creative peak. The remaining duo proved through their link up with Patrick Moraz in Refugee that they too were far from a spent force. 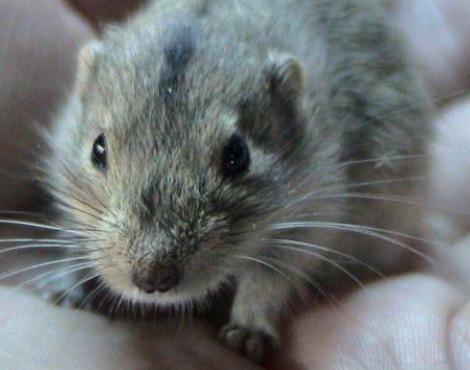 As for "Elegy" though, it is really only for the devoted fan of The Nice. 'Hang On To a Dream' - I may be wrong, but I think the two live cuts featured on Elegy were from the same Fillmore East concert recorded by the Nice for their self titled 3rd album? Here we get Tim Hardin's melancholic waltz tune expanded and inflated beyond anything the original composer would have ever dreamed of (or perhaps feared) The trio set forth on a very arresting and lengthy jazz jam at it's centre that contains some wonderful piano from Keith and tasteful support from Lee and Brian on bass and percussion respectively. We also meet here the technique of plucking the piano strings with a guitar plectrum from inside the soundboard which Emerson later exploited on Take a Pebble with ELP. In the live environment the effect is that of a rather splendid psychedelic 'cimbalom/zither' which provides some contrast to the eloquent piano jazz so effortlessly realized beneath Keith's nimble digits. He also employs some Celeste with which to further broaden the tonal palette of textures and all things considered, this is perhaps one of my favourite acoustic dominated pieces by Emo ever. A very underrated adaptation of a very overrated song which probably is deserving of a compositional credit in it's own right. This track was originally going to be included on the Five Bridges album but was left off at the last minute. 'Third Movement, Pathetique' - As good as the orchestral version of this Tchaikovsky piece on Five Bridges is, I actually prefer this trio only rendition, as it illustrates the massive leap in skills the Nice had developed in tackling classical works compared to their first rather tentative steps as heard on Intermezzo from the Karelia Suite on the 2nd album. Towards the end Brian Davison punctuates the underlying groove with a delicious ride bell cymbal pattern that still sends a shiver of delight down my spine every time. Blinky was a very fine player and his performance on this track is all the evidence anyone should ever need as to his credentials of being one of the greatest jazz influenced rock drummers on a par with the more widely celebrated Ginger Baker et al. Those rather wince inducing comparisons at around this time of Emerson being the 'Hendrix of the organ' do have some foundation here but perhaps 'Hammond Taxidermist' may have been a more fitting analogy. Don't let this guy anywhere near ANY of your furniture. When The Nice was not borrowing to some classic composers, they were playing some covers to ensure that their weakness in writing some own and good material shouldn't be too obvious. The band is now even improving this technique. They are covering a cover! And since there was really little material to make a full album, they will almost triple the length of Tom Hardin's Hang On To A Dream in comparison with their prior release! It will be the showcase for Keith to demonstrate his skills on the piano during a long solo. The Nice also proposed another Dylan song (they already did this on their previous studio album) and even if Keith is excellent again on the organ, this song is not a jewel of music to say the least. And it goes on like this till the end of this album. Some classical inspiration for the Third Movement - Pathetique and another excellent live version of America from Bernstein (although the last couple of minutes is quite chaotic). 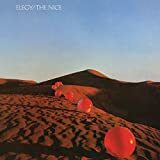 Now, the worst of all is that the last two are extremely well played and the noticeable dominance of Keith Emerson is just a confirmation that he has always had a dominant position in The Nice (although his band mates were very good musicians IMO). At the time of release of Elegy, he had already embraced his ELP career. The bonus tracks hold an old B-side track from '68 (Diamond Hard Blue Apples Of The Moon) and material spread over their earlier releases already of which the very special Dawn is not without interest. In all, this is an average album and the taste of the Nice to serve the same meals several times is just whispering to me to downgrade it to two stars. I honestly don't know how much the band members had to do with compiling this post-breakup hodge-podge, but this has all the markings of an attempt to cash in on the contemporary success of Emerson, Lake and Palmer. From that perspective, it actually kinda worked, peaking at #5 on the UK album charts, but I find it a maddeningly mediocre (and almost outright bad) album in its own right. It's another half-live, half-studio affair, though unlike Nice it sets the live material as bookends and puts the studio material in the middle, and both portions are essentially vehicles for semi-engaging Emerson noodling with little of note from the other members. Now, I like Emerson noodling as much or more than most people would, but he can only carry things so far, and this doesn't come close to representing him at his engaging peak. The studio tracks are awful at worst and pointless at best. Once again the band decides to take on a Dylan cover, this time choosing my beloved "My Back Pages," and while I appreciate the band's efforts to embellish it during the instrumental breaks, I find that I just can't get beyond the singing. Dylan's vocals in the original might irritate some, but he conveyed a perfect balance of humility and majestic power in them. Jumping forward a few years, the version that The Byrds did on Younger Than Yesterday preserved the emotional heft of the original vocal part while adding some nice harmonies and making it a bit more tuneful. This version, though, is a vocal massacre, and whether the tendency to fall out of key repeatedly was intentional doesn't really matter to me. Among the list of artists whose work I generally respect, this is one of the worst Dylan covers I can think of (oddly, another contender for this title is a "My Back Pages" that The Ramones did on Acid Eaters). The other studio track is the band's interpretation of the 3rd movement of Tchaikovsky's 6th symphony, done in live form on Five Bridges, and it's as dull and pointless as before. As I've said before, the movement is amazing and majestic and rousing and everything a scherzo should be, but it doesn't seem like the band (read: Emerson) really knew what to do with it. There's a distressing sense of auto-pilot here that wasn't really present on the band's "Karelia Suite" interpretation, and certainly wouldn't be present on Pictures at an Exhibition. The live tracks are a little better on the whole, but not enough so to save the album. In "Hang on to a Dream," the vocal parts improve from "awful" to "anonymous," thanks to the elimination of the generic female chorus and Jackson's very quiet and timid delivery, so that helps some, though not a lot. Emerson leads the band through a lot of different styles over the course of 12 minutes, and it's fun to hear Emerson fully turned loose, but the mid- section could have just as easily been transplanted into any other song. Personally, for this sort of Emerson playing, I'd much rather listen to his piano improvisations in the Welcome Back live album a few years later. And finally, there's a 10-minute rendition of "America," which is a lot of fun for about 6 minutes, then gets a little too organ-stabby-feedback-y for a while, but ultimately is still a blast on the whole. If there's a reason to buy this album, it's definitely "America." That's not really a great endorsement for the album, though; the original studio version is ultimately superior. I should note that the version I acquired, the 1990 CD release, has a bunch of bonus tracks, but these are just the studio renditions of a bunch of stuff from the first couple of albums. "Dawn," "Diamond-Hard Blue Apples of the Moon," "Daddy Where Did I Come From?" and the like. Were the people reissuing this were counting on the first albums going out of print, so that this album would be the only way to get those tracks? In any case, don't let these entice you into thinking you're getting live or alternate renditions of these tracks if you've already heard Emerlist Davjack and Ars Longa. Post a review of THE NICE "Elegy"